Seven Deadliest Unified Communications Attacks provides a comprehensive coverage of the seven most dangerous hacks and exploits specific to Unified Communications (UC) and lays out the anatomy of these attacks including how to make your system more secure. You will discover the best ways to defend against these vicious hacks with step-by-step instruction and learn techniques to make your computer and network impenetrable. The book describes the intersection of the various communication technologies that make up UC, including Voice over IP (VoIP), instant message (IM), and other collaboration technologies. 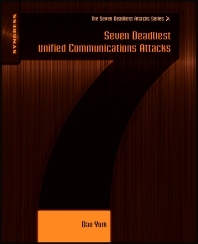 There are seven chapters that focus on the following: attacks against the UC ecosystem and UC endpoints; eavesdropping and modification attacks; control channel attacks; attacks on Session Initiation Protocol (SIP) trunks and public switched telephone network (PSTN) interconnection; attacks on identity; and attacks against distributed systems. Each chapter begins with an introduction to the threat along with some examples of the problem. This is followed by discussions of the anatomy, dangers, and future outlook of the threat as well as specific strategies on how to defend systems against the threat. The discussions of each threat are also organized around the themes of confidentiality, integrity, and availability. This book will be of interest to information security professionals of all levels as well as recreational hackers. Strategy #2: Change Default Passwords! Dan York (CISSP) is the Best Practices Chair for the VOIP Security Alliance (VOIPSA) as well as the producer of "Blue Box: The VoIP Security Podcast" where since October 2005 he and co-host Jonathan Zar have discussed VOIP security news and interviewed people involved in the field. Dan is employed as the Director of Conversations at Voxeo Corporation heading up the company's communication through both traditional and new/social media. Previously, Dan served in Voxeo's Office of the CTO focused on analyzing/evaluating emerging technology, participating in industry standards bodies and addressing VoIP security issues. Since the mid-1980s Dan has been working with online communication technologies and helping businesses and organizations understand how to use and participate in those new media. Dan frequently presents at conferences, has authored multiple books on Linux and networking and writes extensively online at sites such as www.voipsa.org/blog and www.disruptivetelephony.com.